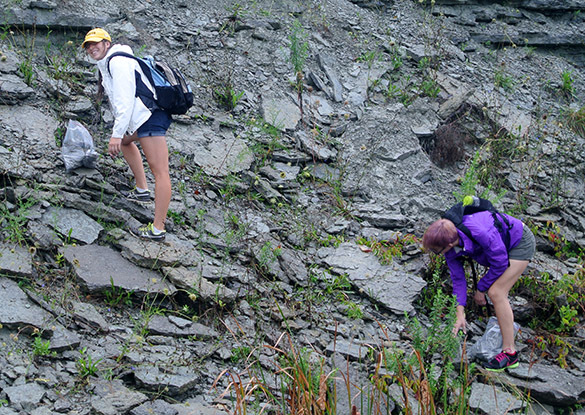 Today the Invertebrate Paleontology class at The College of Wooster drove south to one of our favorite outcrops: the Waynesville, Liberty and Whitewater Formations (= Bull Fork Formation) at the emergency spillway in Caesar Creek State Park. 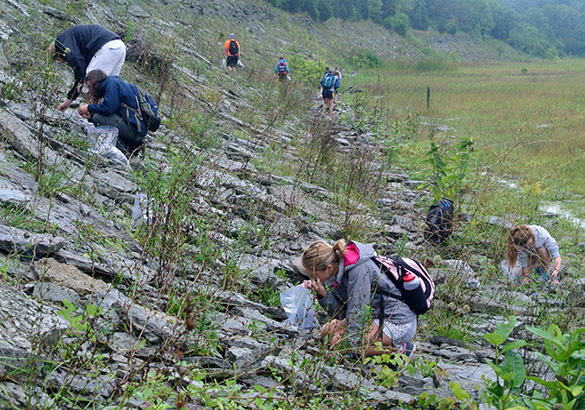 I enjoy taking students to this extensive exposure because it has diverse fossils, is easy for beginners, and it is hard to get lost here! The rain was unrelenting on our drive down, and it continued well past our arrival at the Visitor Center. The park manager very helpfully showed us a new park movie and gave us a talk about the Army Corps of Engineers (which runs the dam and lake). This occupied us as the rain slowed and finally ended soon after we approached the rocks. You’ll see surface water as a theme in these photos because the spillway turned into meandering streams and wetlands. Above is an example of why we visited Caesar Creek. 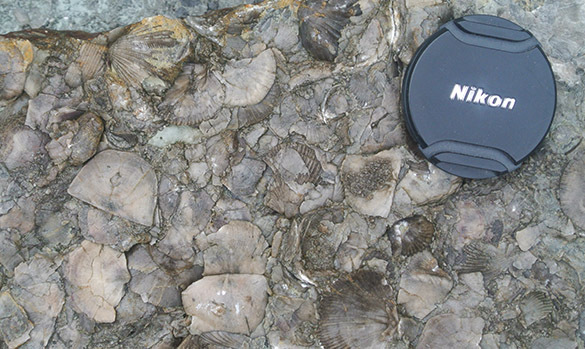 The fossils are fantastically abundant and well preserved. 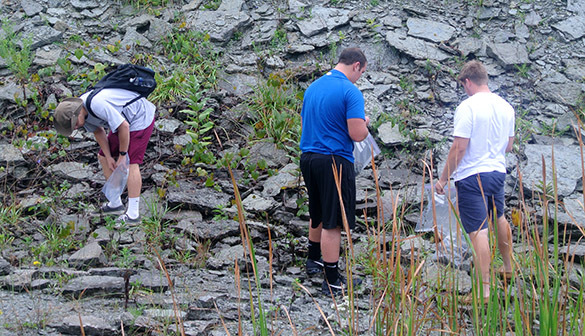 The students had a simple charge: collect a diverse array of fossils, enough to fill two large bags each. 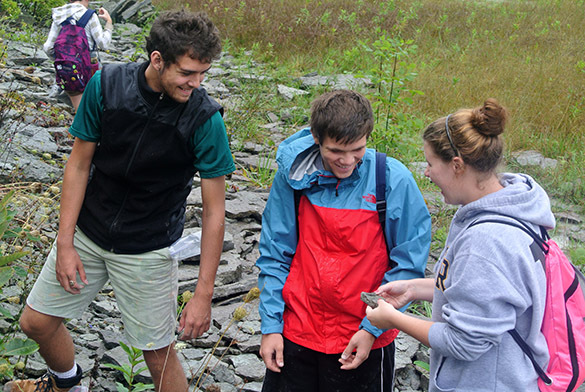 They will prepare and identify their fossils throughout the semester as a field/lab exercise. 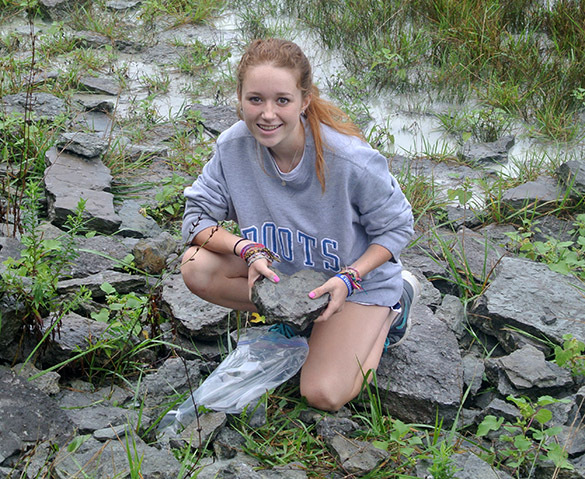 Since I’ve shown these fossils many times in this blog, I’ll use the rest of the post to show off my students. Chloe Wallace is here in the foreground braving the mud on her knees. Kelli Baxstrom (upper left) has a nearly full bag, and the flash of purpleness in the lower right is Spencer Zeigler. 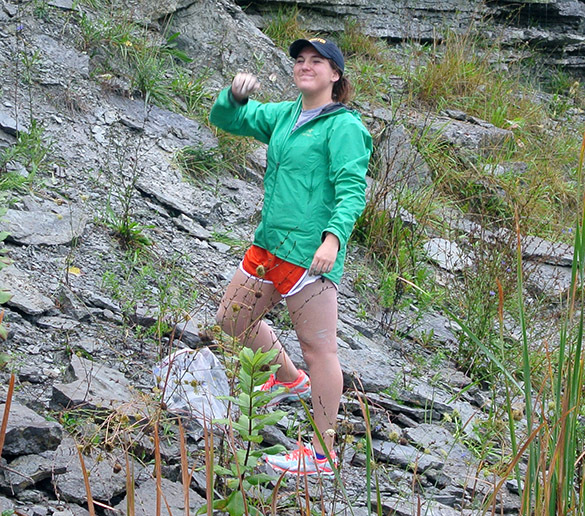 Mary Reinthal shows her enthusiasm for her first fossil expedition. 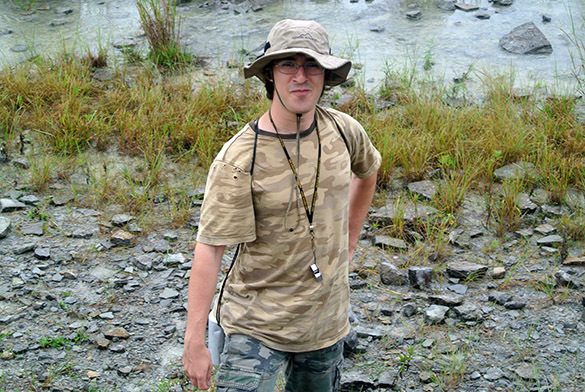 Andrew Conaway was always easy to find on the outcrop. 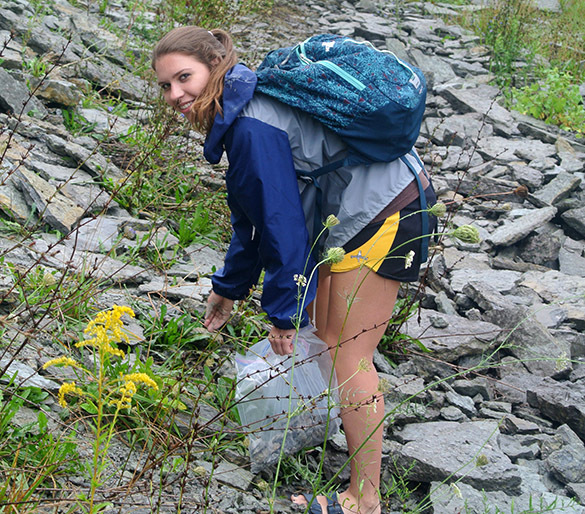 Annette Hilton is here examining a slab full of small strophomenid brachiopods. Cassidy Jester has a slab almost too large for her bag. Note the standing water behind her. 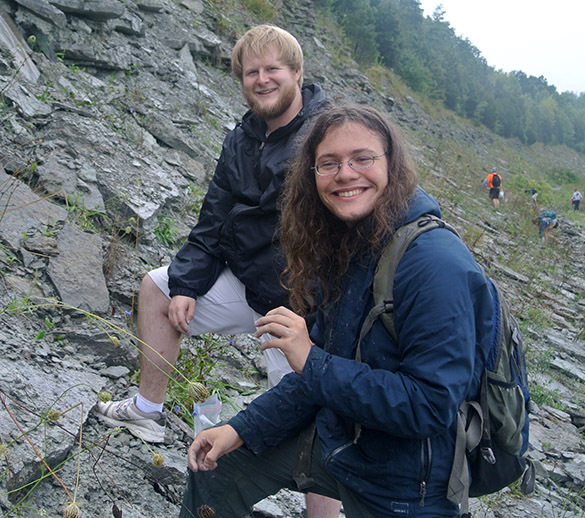 Curtis Davies (back) and Galen Schwartzberg show the happiness that comes with fossil collecting (especially when the rain stops). Dan Peraza-Rudesill and Jeff Gunderson are joyfully receiving instruction from the class Teaching Assistant, Krysden Schantz. 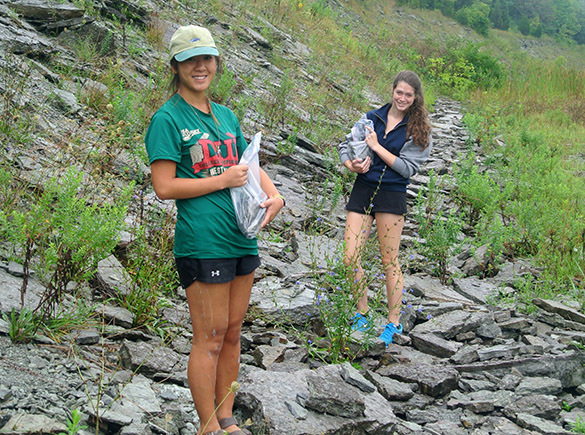 Mae Kemsley and Kaitlin Starr proudly carry their first bags of fossils. 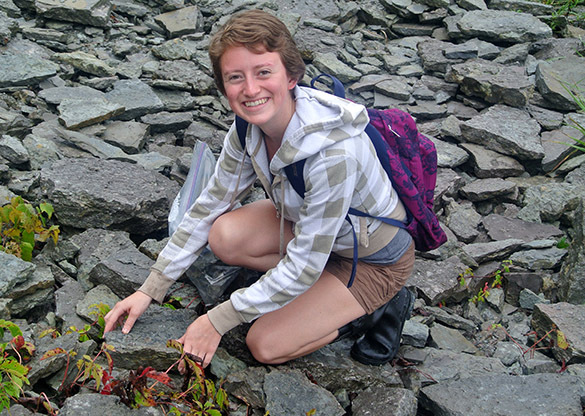 Meredith Mann reaches with mud-stained fingers for more fossil treasures. William Harrison is a senior who wanted to come along for the fun and to possibly add to his senior independent study materials. 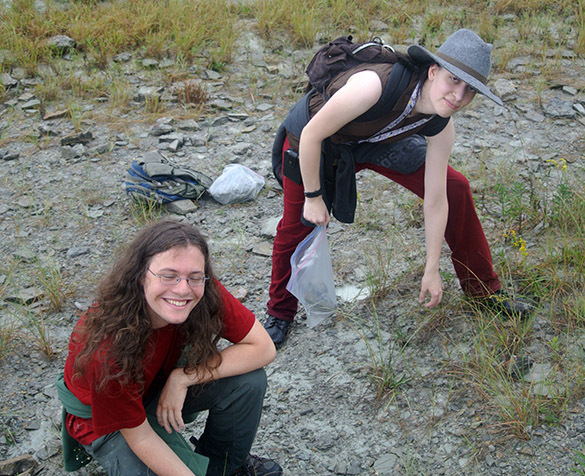 He was a great help with his advanced paleontological knowledge. And here is the class at the end of the session with their collections. I was very pleased to see how dry everyone was. We had a window of respite for collecting because soon after lunch it began to rain again. We were only missing Julia Franceschi, who had a scheduling conflict. I’m looking forward to seeing all these fossils once they are cleaned and prepared in our paleontology lab. 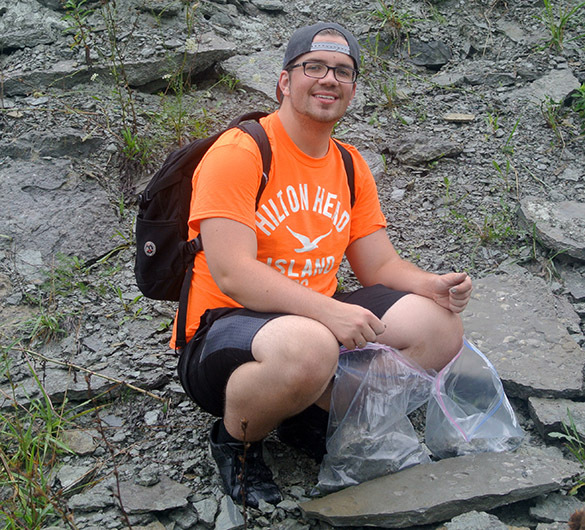 At the end of the semester each student will have a full report on the fossil fauna at Caesar Creek, including identifications and paleoecology.